Should the time come when you decide a full denture is the right choice for you, one must then decide how they will transition into that denture. Normally, remaining teeth are all extracted and then a healing period will be required before impression taking and fabrication visits by your dentist can begin. This healing period will typically be a minimum of 6 to 8 weeks for individuals that heal well, and whose surgery was not complicated by infection or other factors. This healing period can be longer if a patient suffers from some illness, such as diabetes, which can greatly prolong healing. Since fabrication of a denture is done over five separate visits, about 1 week apart, this scenario means that patients could be without teeth from 10 to 12 weeks under IDEAL conditions, and longer under less than ideal conditions. In order to provide patients with teeth right after surgery, the Immediate Denture was developed. This denture is placed the day the tooth extractions occur and never requires the patient to be without teeth and their smile. Immediate dentures are more appropriately called Healing or Transitional Dentures, as they are just something to wear as the patient heals and transitions from natural teeth into a full permanent denture. They are made with the intent that they be worn just 6 to 12 months, while healing ensues and then they are replaced. Immediate dentures are made from a single impression that is taken BEFORE teeth are extracted. From these impressions, a stone model is obtained and that model is then ALTERED at the dental laboratory. They grind off all the remaining natural teeth from the model. This altered model is only a very rough approximation of what the mouth will look like after the extractions are completed. In addition, major bone remodeling will ensue and shinkage of the gums will occur as any inflammation resolves. As such, this type of denture requires that soft relines be placed on the inner surface of the denture and these relines must be replaced multiple times as the healing occurs in the bone and gums and the anatomy of the ridge changes. Once healing has completed, this Immediate Denture is replaced. Its purpose as a healing denture is finished. If it was worn regularly, the patient will be well suited and adequately prepared for their permanent denture. It was once common practice to place a hard reline in such Immediate Dentures and then allow the patient to wear this as a permanent prosthesis. Such practice has fallen out of favor and does not comply with recommendations from professional organizations and denture specialtists. Our office, to comply with standards of care, does not do hard relines in such dentures, and requires a properly constructed conventional denture be constructed. This helps to preserve supporting bone and ensure firm healthy gingiva. 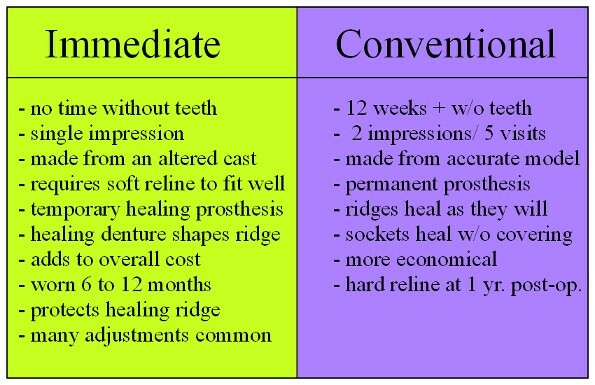 Both of these are required for good long-term success and stability with a denture. An Immediate Denture is often considered a luxury by insurers, who often only allow one denture benefit every five years. This eliminates the possibility of employing this service with the aid of insurance. This often requires the patient to pay for the Immediate Denture. In spite of this stance by insurers, Immediate Dentures are far more than just a prosthesis to give you a smile while healing. Immediate dentures protect tender healing sites and also provide a form for the healing ridge to shape to as it remodels. It also begins to exert forces on the healing tissue which promotes better, collagen rich, pressure bearing tissue formation.